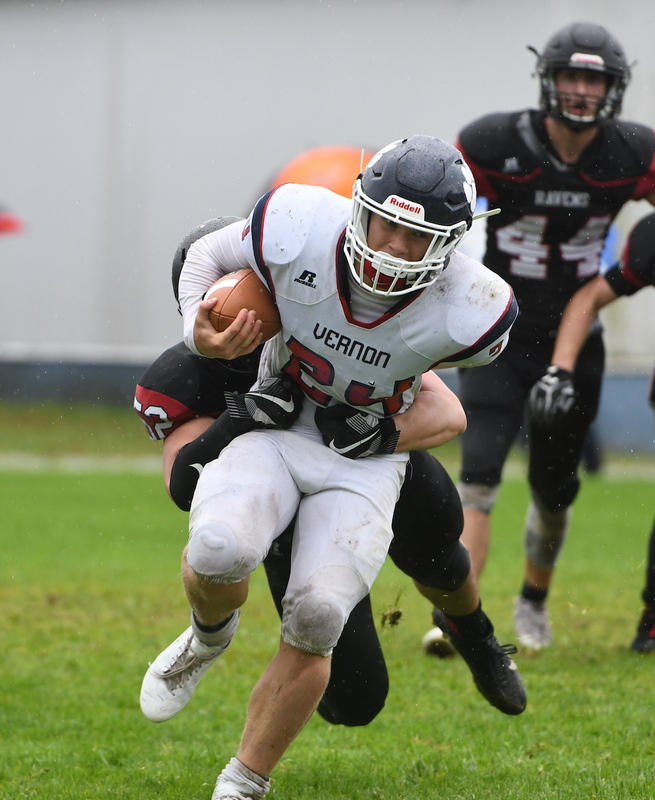 Two seasons after he left on a journey to become one of the elite defensive players in all of Canadian university football, his lasting impact continues to reverberate through the football program Vernon Secondary. So much so that the best way to describe its impact on his high school alma mater is to simply call it The Ben Hladik Effect. On Saturday, in fact, the program which the current UBC Thunderbirds linebacker helped elevate to elite provincial status, takes on Abbotsford’s Robert Bateman Timberwolves in the Subway Bowl B.C. senior varsity Double A championship final (4 p.m., B.C. Place Stadium). 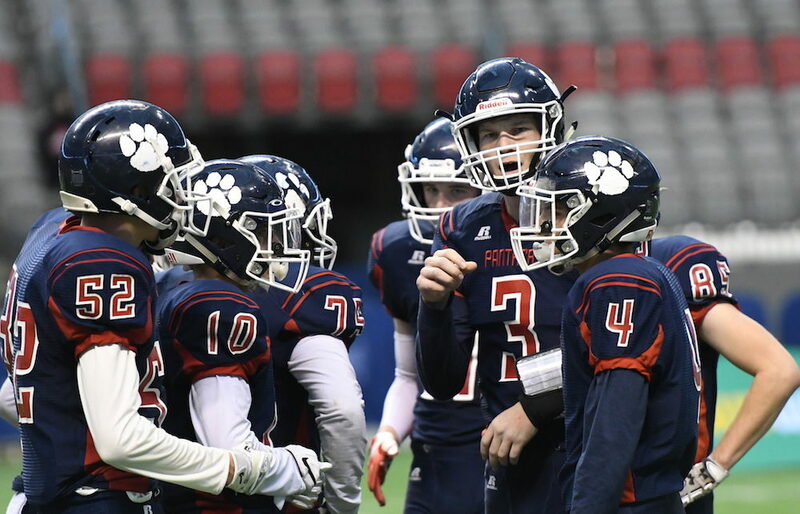 Neither program has yet to taste the spoils of a provincial senior varsity football title, yet if anyone is due, it’s the Panthers who lost in this same game back in 2016 to the Seaquam Seahawks, then were denied a title-game return a season ago in the semifinals when the Abbotsford Panthers rallied to claim a stunning 28-25 decision. Priming that Subway Bowl karma? Last season, Vernon beat Ballenas 36-8 in the Subway Bowl B.C. Double-A junior varsity championship game, becoming the first non-Greater Vancouver/Vancouver Island team to win a provincial JV football crown since they started handing them out in 1979. Now, coming off last Saturday’s stunning 44-0 semifinal win over Nanaimo’s No. 3-ranked John Barsby Bulldogs, here they are again. Three touchdown passes from senior quarterback Thomas Hyett. Three touchdown runs by senior running back Charles Lemay. And if you’re wondering what all of that has to do with The Ben Hladik Effect, Panthers’ head coach Sean Smith is happy to tell the story. By the time he had gotten to his senior year (2016-17) at Vernon Secondary, Ben Hladik was a chiseled 6-foot-4, 225-pound physical specimen who was so naturally instinctive, powerful and athletic that coming off a 2015 Vanier Cup national championship, UBC Thunderbirds’ head coach Blake Nill announced him as the first member of his new recruiting class the following August. Over that same 2016 high school season, Hyett and Lemay took their first big steps as senior varsity players, earning spots on the team as 10th graders. And the player which they, and the rest of the team looked up to, was the senior Hladik whose practice habits, passion for the game and dedication to the weight room were unmistakable. Yet what was most inspiring about the Hladik story was the way he studied the game, and the way he embraced whatever role was handed him in the big-picture interests of the team. He had been a defensive end since ninth grade yet his switch that senior season to linebacker has clearly proven to be one of the best things to happen in his career. 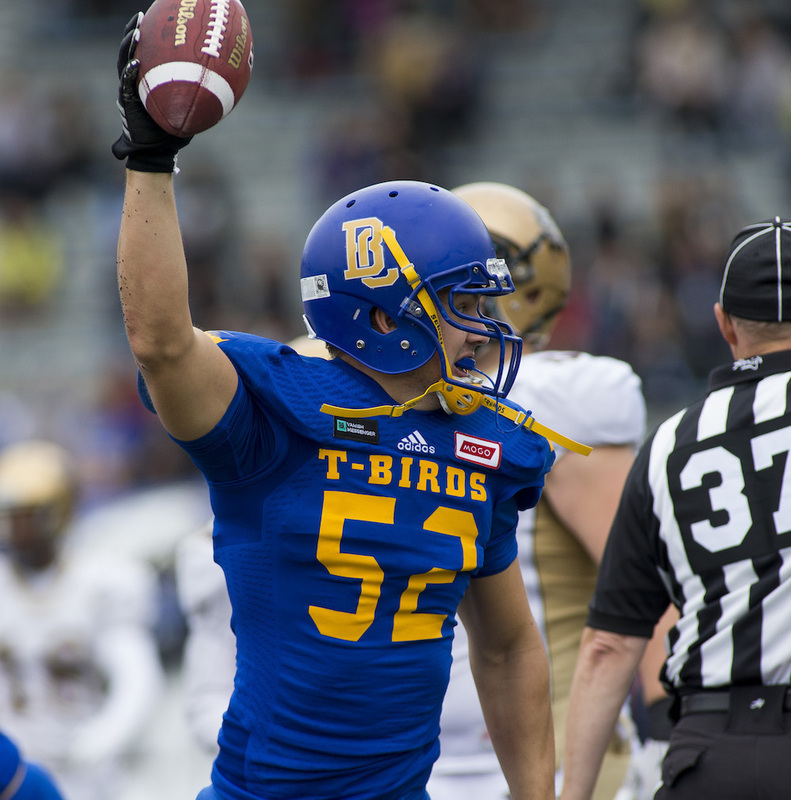 He carried that position with him to UBC, and this past season, Hladik was named the Canada West’s Defensive Player of Year after only his second university campaign. Reference that slice of Vernon Secondary high school history by the school’s best athlete since J.D. Jackson prowled the hardwood back in 1985-86, and Smith rightly feels a sense of pride, the kind that any coach will tell you comes from the development of team tradition. It was certainly not surprising that Hladik was named B.C. Double A football’s Player of the Year in 2016. On Tuesday of this week, two years later, when the time came to handing out the same award, it’s was Vernon running back Lemay who claimed the tier’s highest honour. “He started playing in Grade 8 on a community team,” remembers Smith of the 5-foot-11, 200-pound Lemay. “Back then, I saw a raw athlete more than a football player. But he had potential and he’s really fulfilled it. Serving as the perfect counter-balance to everything the Panthers want to do through the air, Lemay has rushed 103 times for 997 yards and 15 touchdowns heading into Saturday’s finale. The other part of the Hladik persona, about taking on a new position for the good of the team? That sums up quarterback Thomas Hyett’s sacrifice. “I had played receiver up to Grade 9 but the starting quarterback didn’t want to play anymore so they asked me to give it a try,” says Hyett, who joined the senior varsity in the 10th grade as its starting pivot despite a complete lack of experience. “I put a lot of work in with Smith and he has made me what I am today. It feels amazing now. 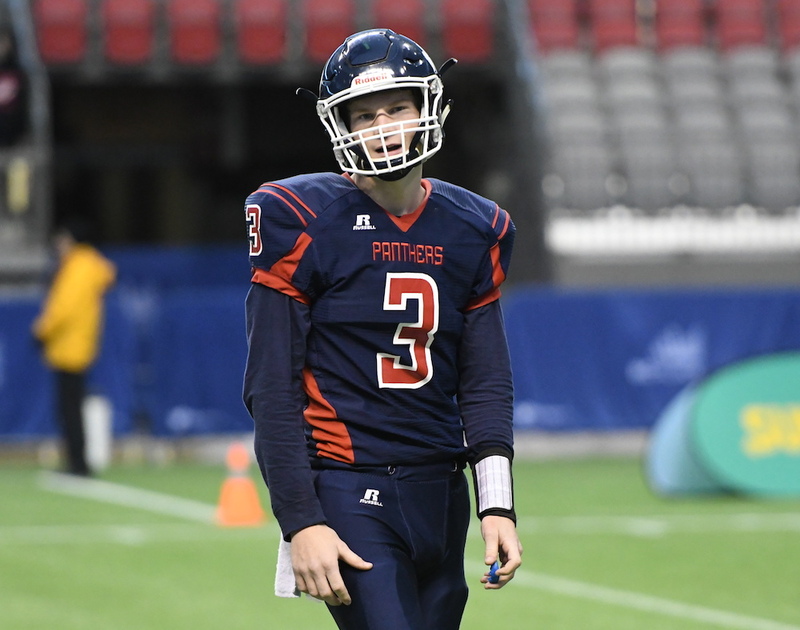 From that very first game to open the 2016 season, coincidentally against Robert Bateman, Hyett has made huge strides to the point where this season, he was selected as the quarterback on the provincial AA all-star team. His efficiency in 2018 has been ridiculous. Not only did he pass at a tidy 64 per cent completion rate (105-of-165), for 1,873 yards he threw 25 touchdowns in eight games and was only intercepted twice. “We were watching some old game film last week because I was thinking John Barsby might pull out some of their old Wing-T stuff,” Smith said of preparations for their semifinal game. All of which brings us back to Saturday’s big game, and how two of the Panthers’ biggest stars this season have followed paths similar to Ben Hladik, a guy who looks destined for a long and successful professional career. It’s all about a special group of 2018 Vernon players who have learned from the heartache of their own history. And it’s all about a group that has come together with a cohesion that its coach swears he will never take for granted. Ben Hladik never got to house a Subway Bowl championship with his Vernon teammates, but if the Panthers happen to find a way to do it Saturday, he should know that he helped give them a big push out the door.